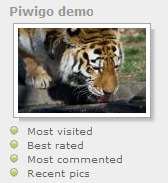 About: PiwigoPress is the one-stop solution for linking WordPress with your Piwigo photo album. Forum: Any precise question should find a good answer. Download count means nothing here from now. WARNING: Remove previous version. WordPress plugin must be in a lower case directory. Link bug with some theme: solved.